Milan Lucic proved pretty quickly that it really doesn't matter what team he's on, he doesn't like to be messed with. 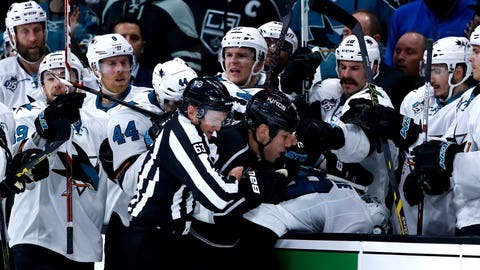 The Los Angeles Kings and the San Jose Sharks rivalry has festered for years and years, and it only took Milan Lucic one game to inject himself right into the middle of it. With just a minute and a half left in the Kings' opening game of the season, Lucic carried the puck out of his defensive zone. As he exits his zone, Sharks' forward Logan Couture comes out of the penalty box and nails Lucic with a submarine hit, upending Lucic. Couture headed back to the bench, but before he could take a seat, Lucic raced across the ice and violently shoved Couture into the bench. A scrum immediately surrounded the two. Lucic doesn't believe his infraction was worth a match penalty, and that it definitely wasn't worthy of any additional punishment. His head coach, Darryl Sutter, agreed. Sutter said the infractions was “at best” a minor penalty. The league will review Lucic's hit and decide if any sort of additional punishment needs to be conducted. Lucic does have two prior one-game suspensions since he entered the league with the Boston Bruins in the 2007-08 season, but he hasn't been suspended since 2011. As for Couture, who was hit up high earlier in the game by Dustin Brown, he's just pouring fuel on fire. The Kings play the Sharks again on Oct. 22.